The ESP Asia Regional Office is established in Gyeonggi-do, Republic of Korea due to active support by the Gyeonggi provincial government and Asian ESP members after the inaugural ESP Asian Regional Conference in 2016. The Asia Office is located close to DMZ (demilitarized zone between South and North Korea), resonating the meaning of “Nature for Peace” in transboundary areas. ESP Asian Partnership: The Asian ES Partnership will be strengthened through data-sharing and cooperative projects among ESP members. ES Training & Capacity Building: In collaboration with GIZ, ESP has conducted training and capacity building programs during ESP conferences. We will further develop ES curriculum and support collaborative trainings to meet the demands of local policy makers and practitioners. “Nature-based Solution” Demo-Projects: To maintain ecosystem services between nature and human and also to achieve sustainable development in our society, we promote “nature-based solutions” and implement integrated ES approaches in collaboration with different stakeholders. ES Fund Raising: To support the acquisition and long-term ecosystem management of critically important biological areas, endangered species habitats and ecological corridors, we initiate PES mechanism and raise ES Fund linked to local projects. 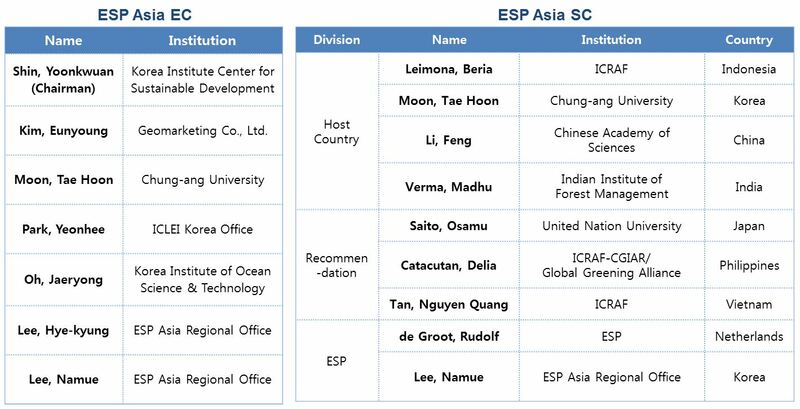 The Executive Committee (EC) and Steering Committee (SC) of ESP Asia Regional Office are selected for the next term 2019-2020. The members of EC and SC are listed below. The ESP Asia office welcomes professionals who would like to contribute their ES policy case to build up a ES policy database worldwide to apply ES approaches into policy implementation. For more details and further inquiries, please contact [email protected].